Many Americans dream of working overseas to experience life in another culture, acquire or strengthen foreign language skills, reunite with a special friend from a year of study abroad, or to provide service in a developing country. The most practical way for most Americans to make this dream a reality is to teach abroad. The most common subject that they teach is English (as a second language). Read below for more information on how to get a job teaching abroad. Hundreds of other teaching opportunities exist in a wide range of subjects at international schools that serve the children of English-speaking diplomats, business people, and other expatriates. Positions at international schools typically require certification or the equivalent background in teacher training and some experience (usually 2 or more years) teaching stateside. Like in the U.S, it is easier for candidates with a background in high demand disciplines like math and science to secure employment. Geographic flexibility, willingness to help with sports or other extracurricular activities, single teachers, or those with a partner who is also a teacher will be more attractive to many schools. A large number of Americans land jobs teaching English abroad each year. English has become the dominant language for international trade, so export countries, particularly in Asia and Latin America, are eager to have their citizens learn the language. Prospective teachers often do not need teaching experience or training in Teaching English as a Second Language to secure employment. Many programs exist which can facilitate the placement of Americans into teaching positions in different locations. Popular options include the Jet Program, which places teaching assistants in schools throughout Japan. Candidates should plan a year in advance since the deadline is in late November. The Chilean Ministry of Education also hires teaching assistants for public schools and provides housing with a host family, health insurance, and a modest stipend to cover some living expenses. The government in Spain offers a very popular program whereby American and Canadian citizens act as cultural and language assistants in the school system and receive a stipend of 700 Euros per month for an 8-month assignment running from October through May. Language assistants work 12-16 hours per week, leaving plenty of time to experience Spanish culture outside the classroom. In addition, participants receive medical insurance. 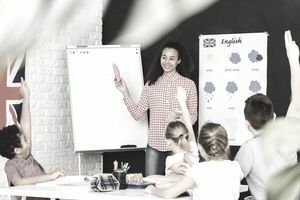 Developed countries in Asia such as Japan and Korea offer some of the most lucrative English teaching opportunities, which are advertised through websites like Goabroad.com. Prospective teachers should communicate with current American teachers at these schools to gain first-hand knowledge about working conditions prior to signing any contracts. Candidates usually land positions by working through organizations like the International Schools Service (ISS), Search Associates, or TIE Online. These services can connect candidates to schools. Other job seekers apply directly to schools. Search Associates and ISS hold teacher fairs in the U.S where international schools interview candidates for jobs. These organizations also list many vacancies through their websites for registrants. Subscription fees do apply. Search Associates also offers an internship program for a limited number of recent college grads without teaching credentials. The Department of Defense (DOD) operates its own schools for the offspring of military personnel stationed overseas. In most cases, the requirements are similar to those for other international schools with a bit more flexibility in some cases regarding requirements like certification and experience. Participating in international service programs like the Peace Corps and WorldTeach is another way to travel overseas to teach. Teaching English is one of the most common placements for Peace Corps volunteers. Volunteers have the opportunity to work in developing countries in Africa, Latin America, and Eastern Europe. Some volunteers also teach math, science, and health. The Peace Corps charges no fees and volunteers receive a multitude of benefits including a relocation allowance of $8000 upon completing their term of duty, loan assistance, free travel to their service site, health coverage, and preference for federal employment. Those who complete their Peace Corps assignment become members of a large network of alumni who can be of tremendous assistance with future careers. Many other programs, like WorldTeach, charge fees but they often include housing, insurance, and other benefits. Many of these organizations provide fundraising literature that grads can use to solicit donations from friends, family, and community organizations.